PRETORIA – Mercedes-Benz is redefining the Multi-Purpose Vehicle (MPV) segment with the new V-Class. As the youngest and largest member of the passenger car family from Mercedes-Benz, the V-Class sets new benchmarks in its segment with its design and host of innovations. The new V-Class combines room for up to eight people and exemplary functionality with high-class appeal, comfort, efficient driving enjoyment and safety. This makes the Mercedes-Benz among MPVs the perfect vehicle for everyone who appreciates boundless space but does not want to sacrifice style and comfort. Whether travelling with the whole family, heading out for a mountain bike holiday with friends or driving prominent guests to a red carpet event – the new V-Class provides optimum flexibility when it comes to use of the luxurious interior. 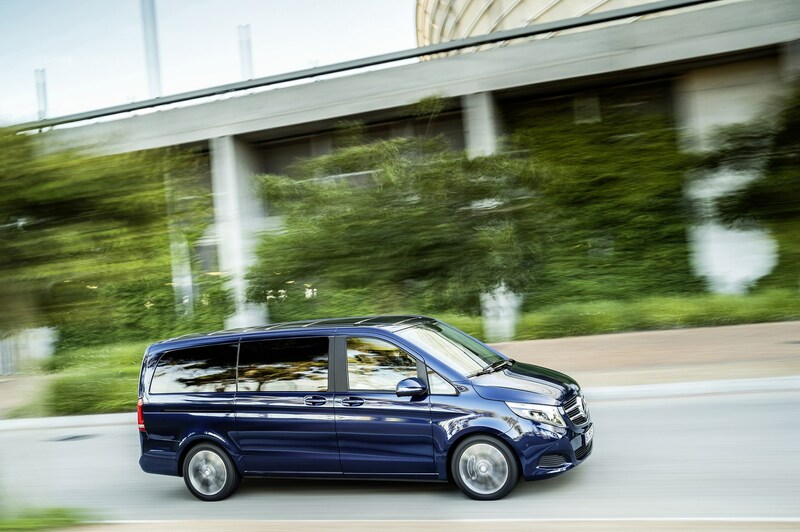 With the three equipment lines: V-Class Standard, V-Class BlueTEC and V-Class BlueTEC AVANTGARDE, an Exterior Sports package and an Interior Design package available for each line, and a host of optional extras, the new MPV can be individualised to suit any taste and requirement. As a result it meets a wide variety of customer needs and is just as attractive for families as it is for people who need a variable and spacious interior for their leisure and sports activities. In addition, it is ideally suited to use as a luxurious VIP transfer or hotel shuttle. “With the V-Class, under the Mercedes-Benz Vans stable, we offer a MPV with versatility, comfort and style, all in one eye-catching package. The variable interior and unmatched driving experience ensure that its advanced levels of safety and efficiency are enjoyed by our customers,” says Nicolette Lambrechts, Vice-President: Mercedes-Benz Vans. A high level of driving comfort and an exemplary standard of safety are ensured by innovative driver assistance systems. They are based on state-of-the-art radar, camera and ultrasound sensors, under the name “Mercedes-Benz Intelligent Drive”. Standard equipment includes Crosswind Assist, which helps to stabilise the V-Class in strong crosswinds, and ATTENTION ASSIST, which warns the driver of inattention and drowsiness. Available as standard is Active Parking Assist, which makes parking of the new MPV as easy and convenient as parking a compact car. Further optional features available are: 360° camera, DISTRONIC PLUS adaptive cruise control with COLLISION PREVENTION ASSIST, Lane Keeping Assist, Blind Spot Assist, the LED Intelligent Light System and Adaptive Highbeam Assist. A number of these assistance systems are available in this segment for the first time. To further enhance safety, the PRE-SAFE® system is available as standard on the V250 BlueTEC and V250 BlueTEC AVANTGARDE, while it is an optional extra for the rest of the derivatives. When an accident threatens, PRE-SAFE® initiates protective measures to ensure that the belts and airbags offer optimum protection during a collision. The V-Class comes to the starting line with the state-of-the-art 2.2-litre four-cylinder turbodiesel engine with two-stage turbocharging, which has already proven highly successful and which has now been further enhanced specifically for the MPV. It is available in three power output levels: The V 200 CDI develops 100 kW of power and a maximum torque of 330 Nm. The V 220 CDI generates 120 kW of power and 380 Nm. This is an increase of 20Nm in each case over the predecessor – but with fuel consumption down by around two litres. With fuel consumption of just 5.7 litres per 100 kilometres and CO2 emissions of 149 grams per kilometre, the V 220 CDI occupies a leading position in its segment. With a power output of 140 kW and powerful peak torque of 440 Nm, the top-of-the-line V 250 BlueTEC engine is as powerful and agile as the previous 3-litre V6 turbodiesel engine. In the acceleration phases, an additional 10 kW and 40 Nm are available (“over-torque”). As a result, the flagship model develops 150 kW and maximum torque of a full 480 Nm. The V 250 BlueTEC accelerates from 0 to 100 km/h in an impressive 9.1 seconds. At the same time, the top model provides an extremely smooth ride and interior noise has been reduced significantly – among other things by means of comprehensive insulation. The new Mercedes-Benz MPV occupies the leading position in its segment thanks to its sporty character and comfortable appointments. Even the entry level V-Class features a comprehensive scope of equipment as standard. Included is the Audio 20 USB with free-standing 7-inch central display, piano-lacquer-look trim, 3-spoke multifunction steering wheel with 12 buttons and sporty DIRECT SELECT selector lever with steering wheel shift paddles in the case of automatic transmission, a steering column adjustable for height and tilt, luxury front seats with sidebags, electric parking brake and active arrest for the rear sliding door. Ground-breaking features in this category of vehicles also include the AGILITY CONTROL suspension with selective adjustment of the damping system to the road conditions and the latest generation of ADAPTIVE ESP®, featuring many assistance functions for optimum driving safety. Low drag is crucial to achieving outstanding efficiency. With a Cd figure of 0.31, the V-Class is the most aerodynamic vehicle in its segment. This outstanding figure is the result of intensive detailed improvement work – from modifications to the basic vehicle design to large areas of underbody paneling and aerodynamically optimised wheel arches and exterior mirrors. Other focuses of the aerodynamic development work were on reducing wind noise and keeping the windows and exterior mirrors largely free of soiling even in inclement weather – a major factor for perceptual safety. The interior of the V-Class is a completely new MPV experience. Highlights include the free-standing central display, the multifunction steering wheel with 12 buttons and DIRECT SELECT lever with steering wheel shift paddles for automatic models, as well as the innovative touchpad, which allows all telematics functions to be operated by means of gestures or by entering characters in the same way as on a smartphone. The touchpad is available in conjunction with equipment starting from the Audio 20 CD or optional COMAND Online. The touchpad is the most cutting-edge control and display concept in this vehicle class. The latest generation of COMAND Online combines all audio, telephone and navigation functions and additionally offers an internet browser, the LINGUATRONIC voice control system and transmission of traffic data in real time. The optional Burmester® surround sound system with 16 high-performance loudspeakers, including a bass reflex loudspeaker, delivers the perfect listening experience. It provides exceptional surround sound, and in combination with COMAND Online allows technically supported front-to-rear voice amplification: where necessary to improve communication, a microphone in the overhead control panel transmits conversation between the driver and front passenger to the rear loudspeakers so that the passengers sitting further away can also hear them. The V-Class also sets new standards in comfort and variability with a host of innovations. The Mercedes-Benz MPV is the only vehicle in the segment to offer optional 4-way lumbar support and active seat ventilation with reversing fans to ensure a consistent relative humidity at the contact area with the leather seat for driver and front passenger. Also unique in this class of vehicles is the enhanced THERMOTRONIC automatic climate control system, which is available as an option in addition to the standard-fit TEMPMATIC system. It has various ventilation modes to offer individual climate control. The FOCUS, MEDIUM and DIFFUSE climate modes have distinct settings for air flow and distribution. Passengers have the luxury of regulating the climate control in the rear of the vehicle as well. The seating in the rear allows numerous configurations to meet any requirements. 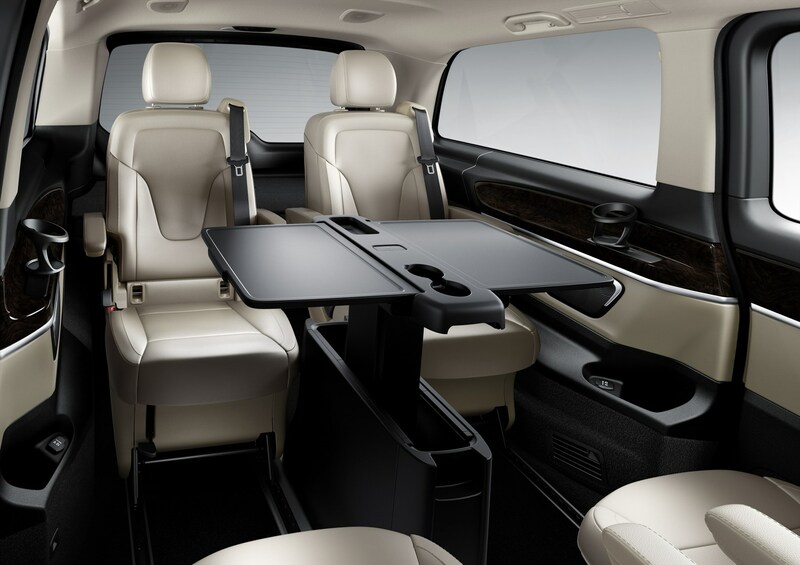 As standard, the MPV can be equipped with four individual luxury seats with armrests in two seat rows. Other configurations include the six, seven and eight seat layout. Thanks to improved technology and operating logic, they can be folded forward intuitively to afford fast and easy access to the rear. As an option, a folding table can be installed between the single seats. Thanks to the optimised seat rails with quick-release system, very little effort is required to move the individual seats and benches or to position them in a number of different ways. They can all be removed as well to create a loading area tailored to specific needs at any time. For easy loading and unloading, the V-Class features another first in this segment in the shape of the separately opening rear windscreen attached to the upper tailgate frame. It can be opened and closed independently of the tailgate. This makes loading and unloading easier in two respects: on the one hand, it allows a second loading level; on the other – particularly in tight parking spaces – there is no need to open the large tailgate. The corresponding load-compartment organiser is easy to install and remove. It can bear up to 50 kilograms and has two recesses, each of which holds a removable and collapsible shopping basket. In the V-Class AVANTGARDE, the separately opening rear windscreen including load-compartment organiser is a standard feature. Another unique feature for the new V-Class: the tailgate is optionally available as an EASY-PACK tailgate, with convenient power opening and closing that can be stopped in any position. As with all Mercedes-Benz passenger cars, the V-Class is introduced standard with the class-leading Mercedes-Benz Premium Drive 6 year/100 000km maintenance contract with no customer contribution.